The self-storage industry keeps expanding and evolving beyond simple storage units for personal items. What are the current trends and how can you take advantage of them to increase your business? The profits will go to the Self Storage owners and operators that take advantage of growth trends and opportunities. Add Services to Cater to Businesses in Your Area. Businesses use self-storage facilities to store files, equipment and excess inventory. They will even run an e-commerce business out of self-storage units - housing packaging and shipping product from their rented unit. Appealing to this market segment can increase profits for your business. More customers are demanding green facilities, which present opportunities for the self-storage developer. Adding solar panels to your facility will pay off with lower energy use, additional revenue from excess power generated and may even qualify for a government rebate. Add Climate Controlled Self Storage. To protect their belongings from cracking, yellowing and mold, customers are willing to pay 15-35% more for Climate Controlled Self Storage. Adding climate control to your existing or new self-storage buildings can differentiate you from your competitors and bring in additional revenue. Ever considered selling rather than renting your self storage units? There are many successful models for the Condo Self Storage Business. Add Boat and RV Storage Amenities. Many ways that developers are finding additional income opportunities is by “tapping” into the mindset of a typical Boat and RV renter and providing amenities that add value. Whether it is Wash Bays or Dump Stations or Mezzanines or Outlets in every unit, amenities are attracting new and profitable customers. Update Outdated Self Storage Buildings. Older facilities are losing market share to newer facilities that are more upscale, aesthetically appealing and offer amenities such as climate control. These newer facilities may be more expensive to construct but the land continues to be the highest percentage of the budget and the higher rents that these newer facilities can demand make them a sound investment. Not only will you increase occupancy rates with a better looking facility, you will save on maintenance costs - and many improvements may even qualify for a tax rebate. If you are near full occupancy, now is the time to expand. Real estate and construction costs remain low making this a great time to add capacity to your existing self storage buildings or acquiring more land to develop. If you have adjacent land, consider adding a multi-story self-storage building with climate control. Other cost effective and relatively quick options for adding rental capacity include portable mini-storage units, AGRI-housing, Boat and RV Canopies or Boat and RV Storage Buildings. If You Can’t Build OUT, Build UP. Double Up is a mezzanine structural design that enables single-story self storage businesses to build up without impacting your current storage capacity. 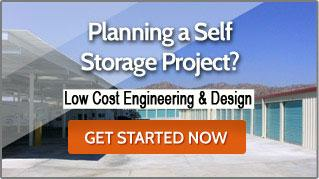 It is no longer necessary to tear down your existing self-storage buildings in order to add capacity. Mako Steel creates additional square footage on an established self-storage site by designing a Rigid Frame Mezzanine that can span two existing single story self storage buildings. We then construct another self-storage building on top of them. The result is additional rentable space for the self-storage operator without the need to tear down the existing buildings. Using the highest quality building products and unmatched customer service, Mako Steel’s team of experts will help you design, engineer and build your self-storage project on time and on budget. Take advantage of our LOW-COST SITE DESIGN AND ENGINEERING SERVICES. Site Plans and Unit Mix plans for new self-storage construction, self-storage renovation and self-storage conversions.